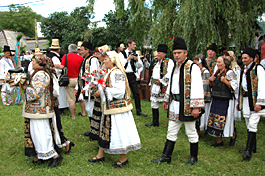 The weddings in Maramureş still follow by and large the old customs. The main roles are naturally given to the bridal couple, the greater parents-in-law (the groom’s parents) and the lesser parents-in-law (the bride’s parents). The wedding godparents also have a very important role. 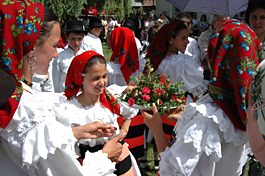 Secondary but very precise roles are given to the “callers” (voinicelul), those who go around the village and invite people to the wedding, the flagman (cantonierul), the bridesmaid, the “larder man” (omul cu cămara), the “hen woman” (femeia cu găina), the musicians, the groups of young men and women, and the wedding guests. A spokesman acting on the groom’s behalf used to ask the girl in marriage, usually getting a positive answer only the third time. Once an agreement is reached, the girl’s dowry is discussed and the date of the engagement is set. Usually the dowry in lands, seeds and animals is given in advance, while the textiles are brought to the new house only after the wedding. On this occasion the bridal couple decides who is going to carry out each role in the ceremony, for example is going to be the flagman. 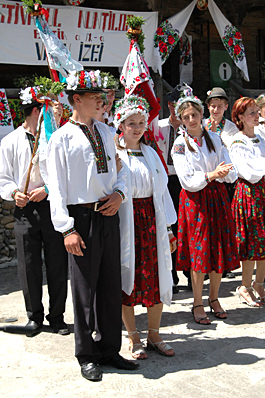 The flagman’s first task is to gather scarves, small bells and other objects that are needed to make the wedding flag. 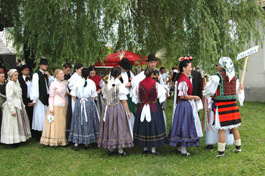 The flag is sown at the groom’s house in the presence of a group of young women and men, followed by a party. 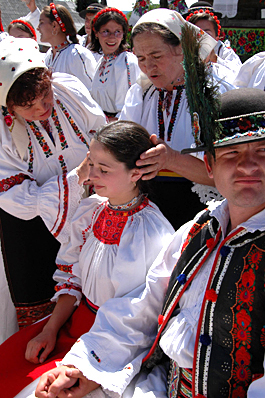 At the same time, at the bride’s house, the most skilled woman in the village makes the bridal crown. 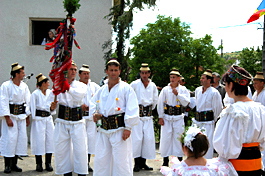 The night before the wedding, known as the flag evening, the flagman, accompanied by a group of young men and musicians, goes to the groom’s house with the flag to dance the “flag dance” (jocul steagului). 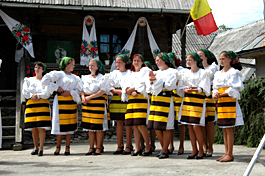 The task of the caller (voinicelului) is to invite the whole village to the wedding. Usually the calling is done several days before the ceremony. Earlier a rather poor villager was given this task, but nowadays the caller is most often a family member. The larder man is chosen among the most honest men in the village. His role is to collect the wedding gift represented by a mug of cornflower and ½ l of ţuică. The drink is then offered at the wedding. He is also in charge of supervising that nobody sits with an empty glass. Nowadays, the wedding gifts are much more abundant, usually sums of money that are read aloud during the party. Both the bride and the groom wear white during the wedding. 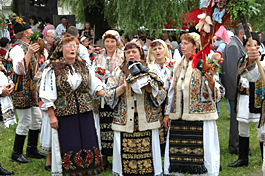 Numerous friends dress the bride in a white blouse and skirt with an apron over it. Over the blouse is worn an embroidered sheepskin vest and a thick woollen fleecy overcoat, the guba, tied with a red belt. 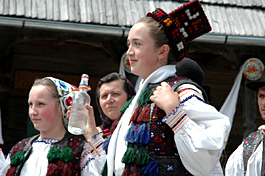 The bride’s hair is plaited with colourful ribbons and her head is covered with a headdress. The bride and the groom each come to the church in their own procession, accompanied by their family and friends. In earlier times, after the religious service, each group went their separate ways to the two houses for the wedding dinner. It was only on the following day that the groom, together with the flagman, friends and family went to fetch the bride. They were served another wedding feast, together with the bride’s family. Afterwards, everyone went to the groom’s house, where still another feast waited. Nowadays, the whole wedding party proceeds from the church to either the bride’s or the groom’s house for the celebrations. 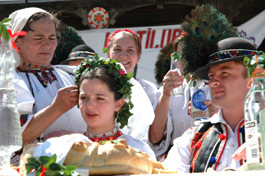 At the door waits the greater mother-in-law who gives big round plaited loaves and bottles of ţuică to the bride. The hen woman throws grain on the couple and the guests for good luck. 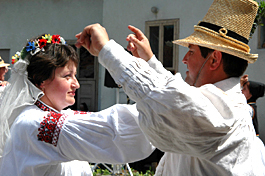 Once inside the house, the bride sprinkles some ţuică where the wedding table is laid. Starting with the flagman, all guests dance with the bride after paying her a small sum. 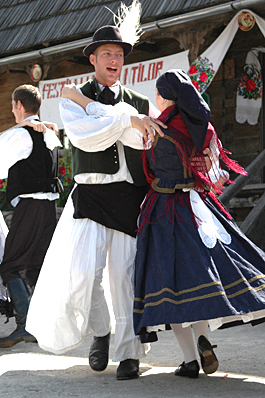 The groom is supposed to pay the highest sum of them all to be able to dance with his bride. The next morning, the godparents come back to the feast and remove the bride’s headdress and replace it with a wifely scarf. Twice the new wife refuses it and only the third time she accepts it. From this moment on she will pin her hair up and cover it with a scarf. This act ends the wedding feast. The godparents are honoured once per year by all those couples to which they have been the wedding godparents. 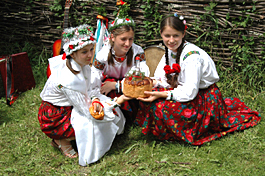 The godchildren bring with them gifts: cups of wheat or corn, ţuică, round twisted bread or even a small, decorated fir tree. Before the feast, toasts are recited, and at the end of the feast, the godmother toasts with everybody. After the bridegroom empties his glass, he presents her with a sum of money. The evening concludes with dancing. 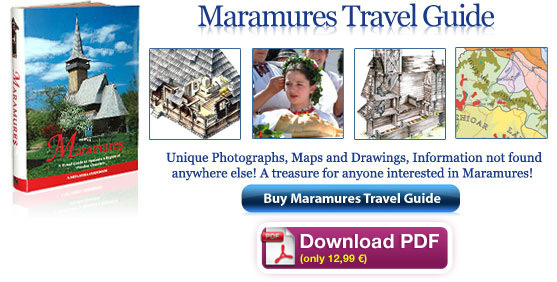 I am going to Romania and willing to visit the wedding festival in Maramures. What date is it to be in 2013? 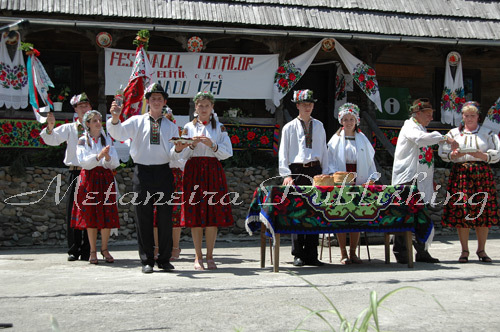 I’ll be in Maramures (Sighetu Marmatiei, Sapanta and landscapes) on 11-12-13 May 2010 and would like to visit to a wedding festival. Is it possible? Thanks. 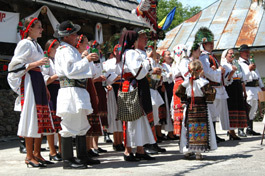 Familia noastra va vizita Romania in Iulie si as dori foarte mult sa arat sotului si copiilor festivalul Vadu Izei. Puteti sa-mi spuneti care sint zilele de festival anul acesta? 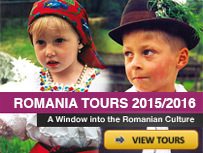 I am in Suceava hoping to get to this years wedding festival. What date is it to be in 2008?